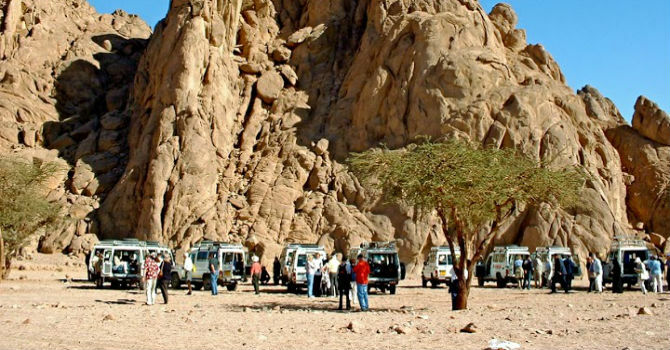 12 pm pick up from hotel by our AC 4*4 Jeep to enjoy an adventure tour in Egypt Eastern desert . The excursion stops for 3 times the first photo stop at a high hill then at the Acacia tree and finally at the quads center to start your ride with 40 minutes quad biking. Admire the amazing sunset view of the desert before arriving at the Bedouin village. Learn about their traditions, taste their Bedouin tea, smoke water pipe, experience short camel ride and buffet barbeque dinner the live Bedouin show is played then transfer back to hotel.